Let’s go find some quiet shady place, and cry till our hearts are empty. No, let’s instead grab our swords, and stand like good men to defend our fallen kingdom! Every morning, more widows and orphans howl with grief. These cries hit Heaven in the face and echo as though the sky itself grieved for Scotland. Macduff is referring to a well known image from the art and literature of ancient Greece: a warrior on the battlefield, standing astride the body of his slain friend, sword drawn, challenging the enemy. 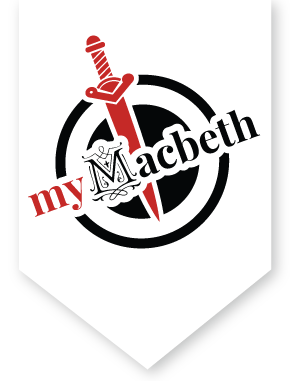 Macduff is proposing that he and Malcolm will be warriors standing astride their conquered homeland of Scotland, confronting Macbeth. "Strike heaven on the face"
Shakespeare’s imagery pictures heaven as a huge face looking down on the earth. Each morning the cries of sorrow from widows and orphans fly up and echo back off the clouds in the sky, as if they had slapped Heaven in the face, causing her to feel Scotland's pain and cry out in a similar grief. As I shall find the time to friend — I will. I’ll grieve for what I believe is wrong, I’ll believe whatever I know is true, and when the time is right, I’ll act on whatever I can fix. What you’ve just told me may be true. This tyrant, whose very name hurts my tongue to say, was once considered an honest man. You loved him, and he hasn’t harmed you yet. Maybe I’m naive, but you might gain something by giving me up to him. You can see it would be wise, like sacrificing an innocent lamb to keep an angry god happy. In an imperial charge. But I shall crave your pardon. royal command. Though virtuous, Malcolm may feel compelled to obey the orders from a king. mighty attack. Malcolm may cave in because he feels overwhelmed by the pressure from Macbeth. But Macbeth is. And even a virtuous nature might be overruled by a king’s command. But excuse me. My suspicious thoughts can’t turn you into something you aren’t. Angels are still bright, even if Lucifer, the brightest of them, fell from grace and became the Devil. Just because many evil things attempt to appear good, that doesn’t mean there aren’t things that appear good which are genuine. I have lost all hopes of getting you to fight with me. According to some interpretations of Jewish and Christian texts, Lucifer was once the brightest of angels, before rebelling against God and becoming the Devil. Maybe you lost hope of gaining my support in the same place where I found my doubts about you, your castle. Why did you leave your wife and child in such a vulnerable position – the most cherished things in your life - without even saying goodbye? Please don’t let my distrust make you feel dishonored, it’s just my concern for my safety. You may have done what was right, regardless of what I think. Bleed, bleed, poor country! Go ahead, tyrant, build your foundation without worry, because virtue doesn’t dare stop you. Go ahead and flaunt the wrongs you’ve done, good people are awed by your title. Farewell, my lord. I wouldn’t be the villain you take me for, not for the whole country under Macbeth’s rule and the rich Eastern lands thrown in as well. The title is affeered. Fare thee well, lord. Macbeth’s title—therefore his tyranny—is confirmed (the legal definition of affeered) because no goodness dares to challenge it. Malcolm will not press his claim to the throne (his title) because he is afraid (a-feared). The far East, where spices and silk were imported from, was thought to be full of riches. Don’t be offended. I’m not saying I completely distrust you. I agree that our country is sinking into slavery. She weeps and bleeds, and every day a new wound is added to her others. Given this, I think there would be people to support me, and the gracious king of England has offered to lend me several thousand soldiers. But, in spite of all this, even if I trample the tyrant’s head under my foot, or stick it on my sword, my poor country will be more full of vice than before, suffer more, and in more terrible ways, all because of the person wearing the crown. I’m talking about myself. I’m aware there are many varieties of vice deep in me. If they were publicly known, evil Macbeth would seem pure as snow and innocent as a lamb, compared with my unlimited evil. Not in all the ranks of Hell could you find a devil evil enough to top Macbeth. I’ll admit it, he’s murderous, lecherous, greedy, lying, deceitful, quick-tempered, malicious, and he smells of every sin that has a name. But there is no limit at all to my lust. Every wife, daughter, mother, and young woman in Scotland wouldn’t satisfy my lust. My desires would overcome any restraints that might come between me and taking what I want. It would be better to have Macbeth than someone like me as king. Giving in to your desires without limits would be tyranny! That’s been the undoing of many kings. But still, don’t be so afraid to take what is yours. And yet seem cold; the time you may so hoodwink. You can indulge in your pleasures to a large extent while still appearing virtuous. You can fool everyone around you. There will be plenty of women willing to sleep with you. And there can’t be so much lust in you that you’d run out of women willing to give themselves to the king once they know he wants them. But along with this, in my evil nature there is also such an insatiable greed, that if I were king, I’d kill noblemen just to take their land. I’d want one man’s jewels, another one’s house. And getting things would just whet my appetite to steal even more. I’d start unjust quarrels with my good and loyal subjects, and then destroy them for their riches. Desire his jewels and this other's house. This greed is a more profound and harmful vice than youthful lust, and it has caused the death of many of our kings. But don’t be afraid. Scotland has plenty of resources to satisfy you, riches to which you are already entitled as king. All these vices are bearable when counterbalanced by your virtues. But I have no virtues! All the characteristics of a good king – justice, honesty, self-control, stability, generosity, perseverance, forgiveness, humility, love, patience, courage, determination – I don’t have any of them! But I have so much of every kind of vice, acting them out in every way. No, if I were in power, I’d pour the milk of harmony into hell, disrupt peace everywhere, and destroy all trace of unity in the world. If a person like me is fit to be king, say so. I’m just as bad as I’ve said. Fit to be king! No, a person like that is not fit to live. Oh, miserable Scotland, ruled by an illegitimate murderer, when will you see peaceful times again, since the legitimate heir accuses himself of being too monstrous to rule and disgraces his own family? Your royal father was a saintly king. Your mother spent more time on her knees praying than standing up, living every day a life of piety. Farewell! These sins you confess force me to leave Scotland forever. Oh my heart, your hopes end here. Macduff, your virtuous anger, born from your integrity, has wiped away my dark suspicions, and convinced me that you’re truthful and honorable. The devilish Macbeth used many of these same tricks on me trying to win me over to his side, and prudence prevents me from believing things too quickly. But let God set things right between us. Starting now I’ll follow your guidance, and I take back my self-condemnation. I renounce the awful things I said about myself, as having nothing to do with me. I’m still a virgin, I’ve never told a lie, I’ve barely coveted what I already own, I’ve never broken a promise, I wouldn’t betray the devil himself to his fellow devil, and I love the truth as much as I love life itself. The first lie I’ve ever told was this one, about myself. My true self is yours and our poor country’s to command. Indeed, before you showed up, Old Siward, along with ten thousand men ready for battle, was setting out for Scotland. Now we’ll go together, and may the chances for success match the justness of our quarrel. Why aren’t you saying anything? Hearing such welcome words after such unwelcome ones is hard to handle. Be like our warranted quarrel. Why are you silent? [To Doctor] Comes the king forth, I pray you? Well, we’ll talk more later. – Tell me, is the king coming? Yes. There’s a group of sick people waiting for him to cure them. Their sickness resists all attempts to be cured by medicine. But the king’s touch – heaven has granted him this saintly power– is able to make them healthy. What disease is he talking about? They call it the Evil. I’ve seen the king perform this miraculous work many times during my stay here in England. Only he knows how he does it, with Heaven’s help. But he cures the most bizarrely afflicted people – their bodies swollen and ulcerous, pitiful to look at, hopeless for treatment – by hanging a gold medal around their necks and saying a special prayer. And it’s said that each king passes along this healing power to his successor. He has the heavenly gift of being God’s agent, along with various other blessings that show him to be graced by God. He’s from Scotland, but I don’t know him. Oh, I know who he is now. May God remove the cause that keeps me separated from my countrymen. Are things the same in Scotland? The means that makes us strangers. Alas, poor country! She is almost afraid to look at herself. And she’s not longer our mother, but our grave, where only fools who know nothing smile. Sighs and groans and shrieks tear the air apart, but no one notices. Violent sorrows are an everyday emotion, and when you hear the funeral bells, hardly anyone asks who they are for. Good men die before the flowers in their hats wilt, killed before they have the chance to die from normal illness. Your words are too accurate, and all too true! What are the latest troubles? Too nice, and yet too true. That of an hour's age doth hiss the speaker. Bringing news even an hour old will be hissed at for being out of date. Every minute creates more terrible news. The tyrant hasn’t disturbed their peace? No, they were very much at peace when I left them. Don’t give me such short answers, what’s going on? Be not a niggard of your speech. How goes't? When I left to bring you news – the heavy news I’m burdened with – I heard a rumor that many distinguished men were rebelling. This was confirmed soon afterwards when I saw the tyrant’s army on the march. Now’s the time to help us! Your presence in Scotland would cause men to take up arms and women to fight and cast off their distresses. They can take comfort, for we are coming there. The good king of England has lent us Siward and ten thousand soldiers. There is no better or more experienced soldier in the Christian world. For that I saw the tyrant's power a-foot. If only I could reply with news as comforting! But my news should be howled out in the middle of desert where no one could hear it. What’s the news about? The general suffering of the kingdom? Or is it a private sorrow for just one man? No honorable person could hear this news without feeling sad. But most of the horror belongs to you. If it’s mine, then don’t keep it away from me. Quickly let me have it. Hum. I guess at it. Please don’t hate me forever for having to tell you the worst news that you’ve ever heard. Oh! I can guess what it is. Your castle was ambushed, and your wife and children were brutally murdered. To describe it would be to add your own dead body on top of theirs. Merciful heaven! Come on, man. Don’t hide your grief. Put your feelings into words. Unspoken grief will gnaw at you and break your over-burdened heart. "quarry of these murdered deer"
A quarry is the assembled carcasses of deer killed on a hunt. The corpses referred to here are Macduff’s “deer” ones—his wife and son. Your wife, children, servants, everyone they could find. And I couldn’t be there! My wife was killed too? Take some comfort. Taking revenge will be the cure for this terrible disease of grief. He has no children. All my pretty ones? Did you say all? Oh hell! All? What, all my pretty chickens and their mother killed in one awful day? Did you say all? O hell-kite, all? This common phrase comes from this line in Macbeth; you’ve probably heard it in everyday conversation. A “swoop” is the attacking dive of a bird of prey. Fight it like a man. I will. But I must also feel it like a man. I can’t help remembering the things which were the most precious to me. How did heaven watch this happen, and not intervene to help them? Sinful Macduff, they were killed because of me — worthless as I am. They were slaughtered, not for their sins, but for mine. Let heaven give them rest. Use this passion to sharpen your sword. Turn your grief into anger. Don’t calm your heart down, fill it with rage! They were all struck for thee — naught that I am. Fell slaughter on their souls. Heaven rest them now. Convert to anger. Blunt not the heart, enrage it. Bring thou this fiend of Scotland and myself. O, I could easily cry like a woman and bellow! But, gentle heavens, cut the wait short. Put me face to face with this devil of Scotland. Put him within a sword’s length of me. If he escapes my punishment, let heaven forgive him as well. Now you sound like a man. Come on, let’s go to the king. Our army is ready, all we need is his permission to depart. Macbeth is ready to be taken down, and God will make us his instruments. Take heart if you can. Tomorrow will come soon enough. The angels put on their weapons. The angels set on (encourage) their army as God’s instruments of justice. Put on their instruments. Receive what cheer you may.